[Dwight] Howard plans to hire [Shaquille] O’Neal’s agent, Perry Rogers, for his new representation, multiple sources told The Vertical. Rogers could file official paperwork with the National Basketball Players Association as soon as Friday, sources said. Rogers doesn’t have any other NBA clients and established his reputation as tennis legend Andre Agassi’s longtime agent. O’Neal, a longtime public nemesis of Howard’s, had extensive conversations with the Houston center and sold him on the marketing of “Superman” and the representation of Rogers, sources said. 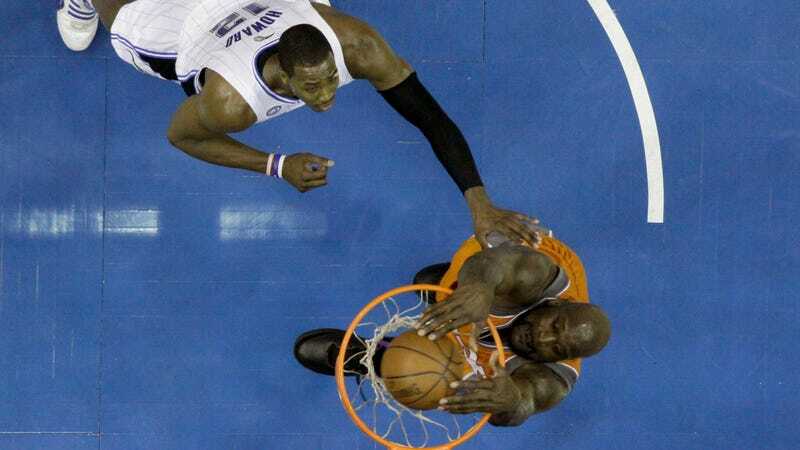 The potential of marketing Howard and O’Neal in advertisements together played a role, too, sources said. Howard has a player option for next season, but is likely to opt-out and chase one last big payday. To represent him, he chose somebody who hasn’t negotiated a max contract in a decade. The reason Howard went with this agent is because Shaq—who has leapt with joy at every opportunity to criticize Howard, and posted a photoshop of him teabagging Howard on Facebook as recently as TWO WEEKS AGO—somehow convinced Howard that the two could market their shared nickname (which refers to a singular character) 20 years after that nickname was cool.